Outdoor organizations can really cost you bigger but going handmade with pallets can really trim down you furniture expenditures and you can use the saved money elsewhere! 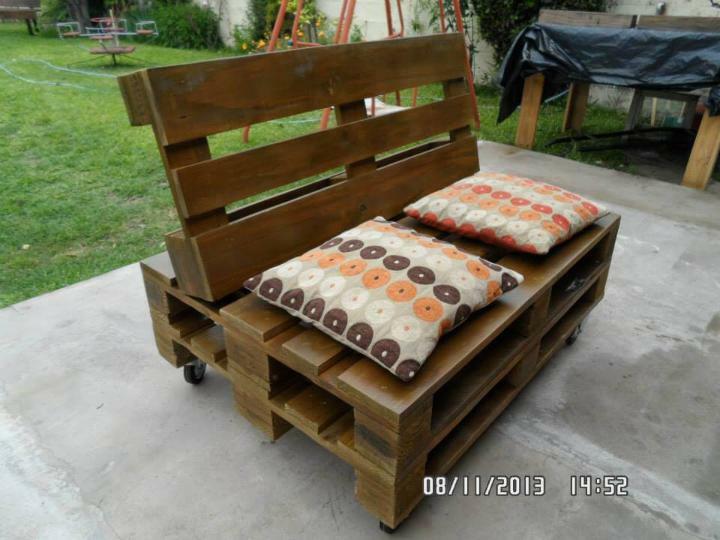 Pallet have now been used as an alternative to reach the luxury and people are getting too much out of it like the furniture, decors, artful crafts etc. 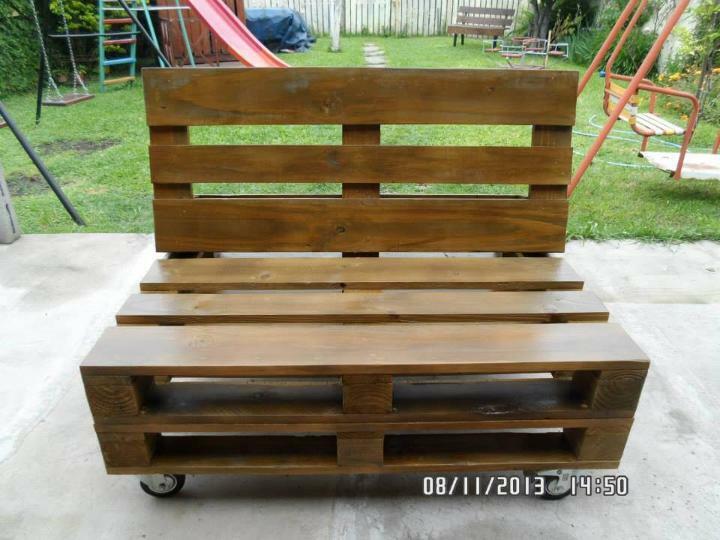 Here we are with this DIY cushioned wood pallet sofa raised on wheels for ease of movement! This seat can give valued sitting at outdoor and can be used in either of garden, home deck and poolside renovations! Cuttings and measurements have been skipped in this project and construction is really simple and straightforward, just stack the pallets up and enjoy this comfy seat to sit all the daylong at patio or in green garden space! Add it to your poolside or to home deck for enjoyable sitting, daydreaming or book reading! This seat is also convenient for storage and cost you nothing but a little effort! Add the cushion or mattress to it to replace the wooden angularity and harness with high-value comfort! Create a bunk of 2 beefy looking pallets and secure them with steel plates and metal brackets!! Use the carriage bolts where you need to create more stability! Adjust the backrest using a half cut pallet board and add the supports to hold it tightly in place, seat is ready to sit! Finish the chair with a clear coat of stain and cushions over the berth section and also the hardware rolling wheels at the bottom for a industrial and super comfortable look! Use it at your lounge, den, courtyard, in backyard, garden, at poolside or at home deck space for a rocking and friendly sitting experience!